Followers of this blog will recognize the name Michael Hyatt. In 2016, I reviewed his book Living Forward in which he shared his method for creating a life plan for one’s life. 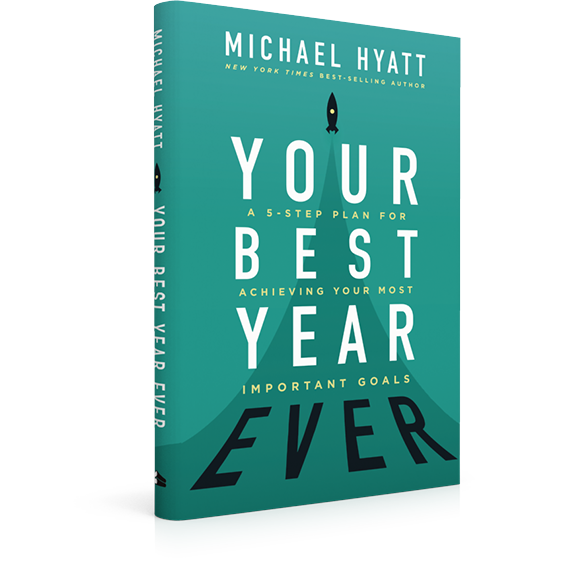 In his new book, Your Best Year Ever, Hyatt drills down on the goal setting slice of your Life Plan’s pie, providing methods for setting and achieving goals. I must place a caveat up front. This book did not have the same punch for me as Living Forward did. With the former, I actually had some life plan illuminations that motivated me to make a few positive changes in my life. I do not really see the same personal benefit from Your Best Year Ever. Perhaps that is because I have been required to create and meet or exceed goals every year of my working life for each of the various positions I have held. Perhaps this is just an area that I feel I have sufficiently mastered. But I am certainly not everyone. This book might be particularly appealing to managers who would like an easy to digest book on effective goal setting to recommend to their employees. The writing is straight forward and engaging, full of vignettes from past clients as well as hypothetical stories illustrating various goal setting points. With sections focusing on why written goals are important, and how to stay motivated, Hyatt goes a step beyond the familiar SMART goals, by proposing the importance for SMARTER goals: goals which are Specific, Measurable, Actionable, Risky, Time-keyed, Exciting and Relevant. Hyatt certainly reaches beyond simply focusing on professional goals, covering goal setting for each of the ten principle life domains of one’s life: Spiritual, Intellectual, Emotional, Physical, Marital, Parental, Social, Vocational, Avocational, and Financial. In this respect, the book dove-tails nicely with Living Forward. I also like his point regarding taking the time to consider why your goals exist. Ask yourself, what is the importance of a given goal? This can prove very motivating to remember when achieving a particular goal gets tough. Hyatt ends his book with a section of sample goal templates filled out for the different life domains that he had defined earlier. The sample pages illustrate how the various aspects of Hyatt’s goal achievement process fit together to form a plan of action that motivates getting started… and sometimes getting started with a goal can be the hardest part! I think that one of the difficulties that I had with this book is that I really felt that Hyatt had the techniques of social media marketers on full blast with this book and the surrounding hype leading up to and through the publication of Your Best Year Ever. I follow Hyatt’s blog as well, and between the book itself and the blog emails, I started to feel like I was caught in an infomercial. I don’t react well to that, which is probably why I am an academic and not in business marketing, lol. But that is another blog for another day. I’m thrilled to tell you that one of Professors whose posts I frequently mention is coming out with a new book in September (preorders are available now!). Bonnie Stachowiak of Teaching In Higher Ed is publishing her book: The Productive Online Professor. I can’t wait to read this book; I know from my own limited exposure to online teaching (mostly creating online modules and providing one time library instruction via video) that this delivery method of instruction is a whole distinct animal that can eat up enormous amounts of time. Bonnie is sharing techniques with us all about how to handle our personal productivity in this challenging environment. Congratulations Bonnie! If you have read my blog for a while, you will recognize my fondness for the work of the academics from the Greater Good Science Center of UC Berkeley. I loved their online MOOC, The Science of Happiness, and now they are launching their Science of Happiness Podcast! It is an interesting premise where the Science of Happiness researchers will run experiments with “happiness guinea pigs” and interview them for the 15-20 minute podcast episodes while also sharing the underlying science behind their reactions. The podcast is hosted by GGSC Director, Dacher Keltner. The folks at Literacy Central (Reading is Fundamental) created a nice quick tool called the Puzzle Creator to design three different kinds of puzzles that can either be completed online (they provide the URL to the puzzle), or printed out. They have word search, crossword and memory match. They limit you to single words of no more than 15 characters, and they give the word answers to the student for the crossword puzzle in a “word bank”, but it is a kind of fun tool for quick puzzle creation. Kent Holsinger, the Vice Provost for Graduate Education and Dean of The Graduate School at UConn started a new series of posts in 2018 on productivity and Getting Organized that are quite nice. I love blogs where an academic documents what works for him or her. Dr. Holsinger is a MAC/i-everything user, which I am not, so his voice adds a nice counter-balance to the posts I have offered over the past several years from the android point of view. While we are on the topic of academics who document in blog posts how their productivity systems, I can also recommend the “How I Plan series” by Dr. Ellie Mackin Roberts. If I may quote directly from Dr. Roberts’ site, ” How I Plan is a collection of interviews looking at how people approach their research planning….It was inspired by Eva Lantsoght’s ‘How I Work’ series on PhD Talk.” I haven’t yet read Eva’s series, but that will be my next stop. John Mason of the bestvpn.com recently posted a nice list of 19 actions that we can easily incorporate in our online activity to better protect our privacy in his Online Privacy Guide. As some of us begin to think about doing some work from home over the holidays… or begin to do some major online shopping in expectation of said holidays, here’s a handy list from the folks at Lifehacker: Top 10 ways to boost your home wi-fi. The minds at the University of Melbourne posted this collection of blogs on the 23 Research Things (2017): Digital Tools to Support Your Research. It is a nice collection to share with your faculty about Open Access, Scholarly Communications, etc topics. Nick Peachey posted on his Scoop.It topic Tools for Teachers and Learners about an online Timeline Maker from the people at TimeGraphics. This free tool integrates with Google apps. And finally, from the wonderful folks at Mindful Magazine, 5 Ways to Thrive at Thanksgiving. To their thoughtful message I will add my prayers that all my faithful readers have a blessed Thanksgiving. For those readers not in the USA, a blessed holiday season as it approaches. I recently ran across a review of a very successful MOOC that Engineering Professor Barbara Oakley created on Coursera called Learning to Learn: Powerful Mental Tools to Help You Master Tough Subjects. I have the course linked in my engineering LibGuides, but Bill Ferster from eLearning Industry wrote an interesting review of this MOOC. He was looking at the course from the perspective of why it was so successful and how to create good MOOCs. His August 30th article, Learning How to Learn: Anatomy of a A Good MOOC, is also worth perusing. Along the same lines, I also promote Dr. Richard Hamming’s YouTube video series Learning to Learn. He taught students at the Naval Postgraduate School in California in the late 90’s. The one that I particularly highlight to my students is Learning to Learn Mathematics. I recently ran across a great round-up of productivity podcasts compiled by Ruth, over at the Delightful Planner. One note: Her link to the archive of Time Hackers podcasts has since moved and I have the correct link: Time Hackers podcast (none since 2016). Have you taken a look at Jane Hart’s 2017 list of Top Tools for Learning? Her list is always a treasure trove of the most popular tools for productivity and learning. This was the 11th year for her survey and she received input from over 52 countries world-wide. YouTube and Google Search maintained their top 2 rankings this year, but there are 52 tools making their debut this year. And finally, a reminder that NaNoWriMo (National Novel Writing Month) is fast approaching. Many people use this event as an opportunity to commit to and achieve many personal writing goals, not just novels, though the official program still focuses on novels. Grant Faulkner is the Executive Director of NaNoWriMo and he recently sat down with the folks at Evernote (an official sponsor of the event) to discuss writing and productivity in this podcast. I hope his message inspires some of our readers to take the plunge and join the NaNoWriMo movement next month. The Learn OneNote Conference 2017 is a totally online conference which requires only registration (free). The pre-recorded videos from OneNote experts can be watched at any time during this one week window. All video content will be removed 48 hours after the conference end on November 13th. You will be offered an option to purchase a Lifetime Access pass to watch the sessions later, but that is not required. The first half of the conference will focus on business users and the second half on education users. Colleen Boff over at Library Worklife had a nice post this month on “Get Organized, Reflective, and Focused Through Bullet-Journaling.” The YouTube link she includes in her article covers how to set up a Bullet-Journal and also includes a video showing how the Bullet-Journal got started via Kickstarter. The Bullet Journal (BuJo for short) system was created by Ryder Carroll. He explained its evolution in his TedxYale Talk, “How to lead an intentional life.” In 2014, his Kickstarter campaign raised close to $80,000, and the bulletjournal.com website was born. And since then, the whole concept of bullet journaling has gone viral, with over one million Instagram posts with the #bulletjournal tag and I won’t even begin to count the Pinterest and Twitter posts. Then there are the Facebook pages: Bullet Journal Beginners with over 19,600 members and Bullet Journal Junkies with over 126,200 members just to name a few. And in case you wondered, yes, there is even a Librarians Who Bullet Journal Facebook group (only 22 members at last glance). There is a significant offshoot of the original bullet journal where artistic individuals have taken the utilitarian pages of the bullet journal and have created works of art with their page layouts. For example, Tsh, over at The Art of Simple, has a very nice post about bullet-journaling with some beautiful sample pages. And if you like the artistic bent to your journal, Dawn Nichole Designs has a nice roundup of how-to bullet-journal tutorials that explore different templates and hand-lettering options. Boho Berry has a multi-post guide to everything Bullet-journaling and a bonus post on using Bullet-journaling for her NaNoWriMo experience. Want a digital version of the Bullet journal? Watch this video by Michele Christensen: How to set up a Bullet Journal-style notebook in OneNote. There are, as with any tool, pros and cons to this technique. On the Pro side, your bullet-journal can be customized by you to contain all the important “stuff” that you need to have at your fingertips, and it will still be accessible if the power goes out and you are beyond a cell signal. On the Con side, it may result in you repeating some calendaring and list maintenance if you currently use (and intend to continue to use) other tools. Also on the Con side, I personally didn’t care for the idea that some used this tool to amass more permanent or ongoing lists, like wish lists, books-I’ve-read, long-term-goals, etc. My reservation with this usage is that the bullet-journals are of static length and pages can’t be easily moved to your next bullet journal when the current one is full. I don’t want to lose, or have to copy over such lists, but that is a minor point and such pages don’t have to be included in a bullet journal. Is Bullet journaling the ANSWER to productivity and self-organization? Every tool is only what you make of it. Take a look at a bunch of bullet journals and decide how this might or might not fit into your life. Does it take more time to keep up with the journal than what you were doing before? Do you find yourself being more burdened by trying to keep up with the actual journaling than you were before? Are you, instead, managing to keep up with things easier and accomplishing more than before? If so, perhaps this is the method for you.